The Elephant Safari Park and Lodge in Taro provides a peaceful sanctuary for displaced elephants, and a highly enjoyable experience for visitors to the island; but it is the story behind its creation, and the history of the gentle giants that ramble across it, that make this park so unique. It’s a chronicle of disappearing forests, neglected elephants, dramatic rescue operations, and a man with a mission and the will power to see it through. His name is Nigel Mason. While you might be reading this and thinking, “Surely these elephants would be better off in the wild,” the answer is yes, in an ideal world they would be, but these animals are refugees from the ongoing war of man vs nature, that has seen the destruction of around 30 million acres of rain forest in Sumatra in the last 30 years. “The species have been hounded out of Sumatra,” says Nigel. Rampant logging has destroyed much of their natural habitat; the rainforest that was once their home steadily replaced by oil palm and acacia plantations. Unfortunately an elephant isn’t discerning enough to differentiate between natural forest and man-made plantations – he just sees food. A single hungry elephant wandering through an oil palm plantation can wreak havoc, eating up to 250 kg a day – that’s a lot of plants, and a lot of lost revenue. “Elephants are migratory,” says Nigel, “they follow fixed routes that may take 12 months to complete. The problem is, when they get back to where they started a year ago, the forest might be gone, replaced with an oil palm plantation for example – and believe me, oil palms are very tasty for an elephant, so suddenly people’s livelihoods are being destroyed.” Deemed as giant pests, farmers and plantation owners sometimes resort to poison, using pineapples laced with strychnine. The ‘lucky ones’ are rescued and relocated to Government training camps, forlorn places that lack the facilities and the funds to properly care for the elephants that literally waste away. Nothing evokes the magical allure of the jungle like an elephant, but for the 2000 or so endangered elephants living in increasingly fragmented pockets of Sumatra, and for the 700 incarcerated in the camps, the future is grim and uncertain. It’s not like Nigel, as a child growing up in England and Egypt dreamt of one day coming to Bali to rescue elephants, but with a life that can only be described as adventurous and colourful, it somehow makes perfect sense that this is what he ended up doing. At the age of 15 he immigrated, alone, to Australia, making a living digging ditches and picking fruit, followed by a brief foray into the music industry. A spontaneous trip to Bali in 1980 sealed his fate, when he fell in love with the island, and not long afterwards with Yani, the beautiful Balinese woman who would became his wife. By 1989 they were running Bali’s first white water rafting tours, which soon morphed into the company Bali Adventure Tours. 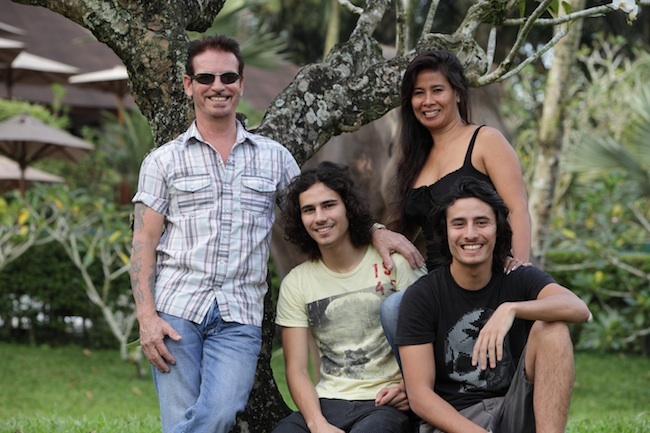 Nigel describes himself as an animal lover, but the elephants came into his life quite by accident when he met a man who had bought nine Sumatran elephants to Bali as a tourism venture, but was having trouble taking care of them. Nigel was so moved by the poor condition of the elephants who were living in a dried out rice field, that he knew he had to do something. “They deserved a whole lot more,” he says. 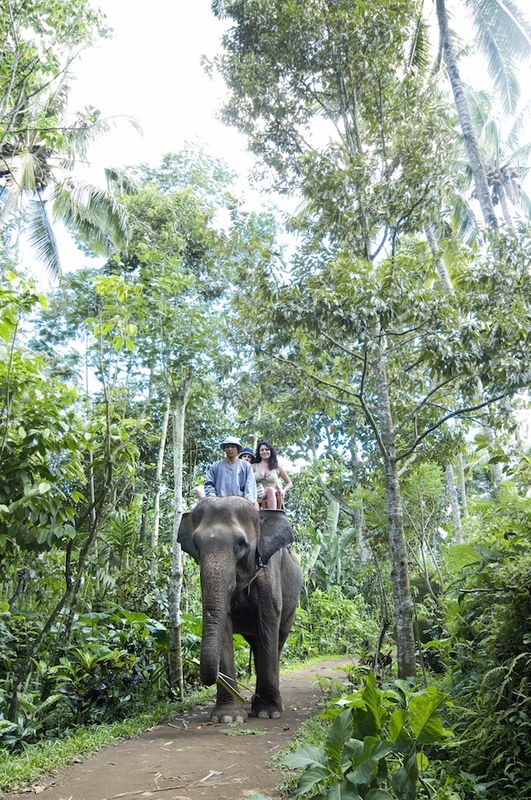 He secured some land in the hills of Taro, north of Ubud, and in 1996 opened the Elephant Park, originally as an adjunct to the rafting business. But Nigel is not a man who does things by half, once he took on the first batch of elephants, he set out to find out everything he could about the animals and how to best look after them. Within a year he was on his way to Sumatra to rescue eight more elephants from the government camps, returning with a ten -truck convoy that travelled six days non-stop to bring the animals to their new home in Bali. By 2000 the park had expanded and improved, to include landscaped gardens, a restaurant, a museum, water treatment, a sustainable waste disposal system and a breeding area. Ready to rescue more elephants, Nigel returned to Sumatra in 2001 planning to bring back another ten, but this mission turned into a four-year heart-wrenching bureaucratic nightmare, in the midst of which Bali was bombed, tourism plummeted and businesses across the island collapsed. Finally in 2004 the paper work was in order, the funds secured and ten Sumatran elephants, including two babies were loaded onto trucks for the arduous trip across three islands to bring them to Bali. An Australian film crew documented the road trip and the resulting film ‘Operation Jumbo’ (available at the park) makes riveting viewing. We walk on to the museum, where I get a crash course on the anatomy, myths and history of elephants. The collection includes original Dr Seuss and Jumbo prints, a 15,000 year-old giant wooly mammoth skeleton, and a pretty decent elephant painting by Ronny Woods. I learn that in the past many elephants lost their lives so their tusks could be turned into billiard balls and piano keys. Moving on to the sprawling open-air restaurant, we take a seat overlooking the bathing pool and the picturesque gardens. Nigel tells me that the Sumatran elephant is the smallest in the world, up to five times smaller than its cantankerous African cousin. While they can be gentle and playful, they have strong and unique personalities and get bored and despondent if they are just hanging around. They also need to exercise, so join the daily rotation for elephant rides, (the weight of two people is easily borne by an 800 kilo creature;) lodge rooms have their own docking station so guests get door to door service. And yes, the adage about elephants having incredibly long memories is definitely true – Ramona, who came by truck in 1996 has gone on to become an exalted painter but she still dances, a trick taught to her by young boys during her days as a youngster in an elephant camp in Sumatra. As we chat, her baby, Guntun, the park’s cheekiest resident and expert gate opener streaks across the grounds, bellowing like a trooper, Nigel tells me that he has also developed his mothers aptitude for painting. While an elephant skillfully kicking a soccer ball or wielding a paint brush may seem a little gimmicky, I learn that in the wild they will often kick around coconuts, or use sticks, pebbles and leaves to make pictures in the earth. 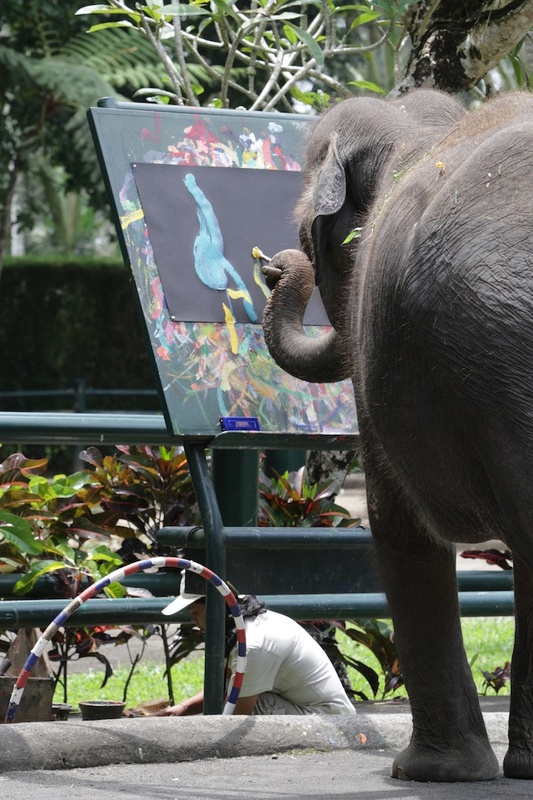 Nigel explains that the park elephants are given the freedom to express themselves in whatever form appeals to them; those that have a natural aptitude for painting are actively encouraged, with results that can only be described as abstract. Each has a different style – although Ramona’s mahout (handler) says “She paints only when she is inspired; ” some of her pictures have sold at Christies for over $3000. The elephants were taught to paint by the founders of the Asian Elephant Art & Conservation Project, who visited the Park in 1999. The aim was to produce saleable art to help raise awareness of the plight of these gentle giants, and to raise much needed funds for the park’s Sumatran Elephant Foundation. While Nigel hopes, in time to bring more rescued elephants to Bali, for now the Sumatran government has halted transmigration, so proceeds from the foundation are used to provide elephants in the camps with extra food, medicine, veterinary care and vitamins. Nigel breaks off from our interview to grab a chainsaw – it seems that one of the trees bordering the bathing pond is dead and in danger of toppling over, tourists gather round to enjoy the spectacle as he skillfully lands the offending trunk in the pond wades through to attach ropes and supervises as two elephants effortlessly haul it out. His absolute commitment, accessibility and hands on approach to everything certainly accounts for a large part of the park’s success, as does his dedication to the environment. For him, “Conservation is not just something that we should do, but something that we have to do.” The park has been built to have a minimal impact and acts as a role model for safari parks around the world. “ We don’t just protect the environment, we remove anything that could damage it;” waste water is turned back into pure water through an advanced filtration/treatment system; manure (truck loads of it) gets turned into fertilizer, and 90% of the 150 staff are from Taro. The village also receives royalties from elephant treks and earns money through supplying food to the park.